Tales of Monkey Island is an adventure game developed by Telltale Games and released on iOS, Mac OS, Microsoft Windows, PlayStation 3, Wii. Escape From Monkey Island is an adventure game developed by LucasArts and released on Microsoft Windows, PlayStation 2. The Curse of Monkey Island is an adventure game developed by LucasArts and released on Microsoft Windows. Monkey Island 2: LeChuck's Revenge is an adventure game developed by LucasArts and released on Microsoft Windows. 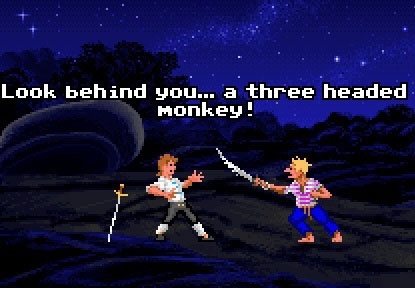 The Secret of Monkey Island is an adventure game developed by Lucasfilm Games and released on Microsoft Windows, PlayStation 3, Sega CD, Xbox 360. Ron Gilbert (Monkey Island 1 and 2) on the seventeen principles he'd follow if he had the chance to make another Monkey Island game.